In a large frying pan, cook diced bacon until crisp. Remove with slotted spoon and add to bean mixture. Leave 2 tbsp. bacon fat in frying pan and add onion. Add ketchup and maple syrup and reduce to about ½ .
Pour mixture into bean pot and add enough water (or apple cider, chicken stock, etc.) to almost cover beans. Taste sauce and add salt and pepper as needed. Just before cooking is finished, add apple cider vinegar. Taste again and adjust seasoning. Hint: It is easy to cook several packages of beans at once. They can be drained and frozen and used in baked beans, chili, soups and pasta or for dips. Open package and run the beans through your fingers, watching for damaged beans or small objects, like pebbles. Soak for several hours or overnight. Cover with water by at least 3 inches. If desired, add a cheesecloth ‘package’ with chopped onion, fresh thyme, rosemary to add flavour. Do NOT add salt until beans are cooked. Bring water to a boil and reduce heat to a simmer. Cook until beans are tender. The cooking time depends on the dryness of the beans and the type and size of beans. After 1 hour, taste them every 15 minutes or so to check. Drain beans, allow them to cool, and, if you are freezing them, package them in set measurements, i.e. 2 cups so they will be easy to use. 2 cups is approximately the amount of beans in a large can. 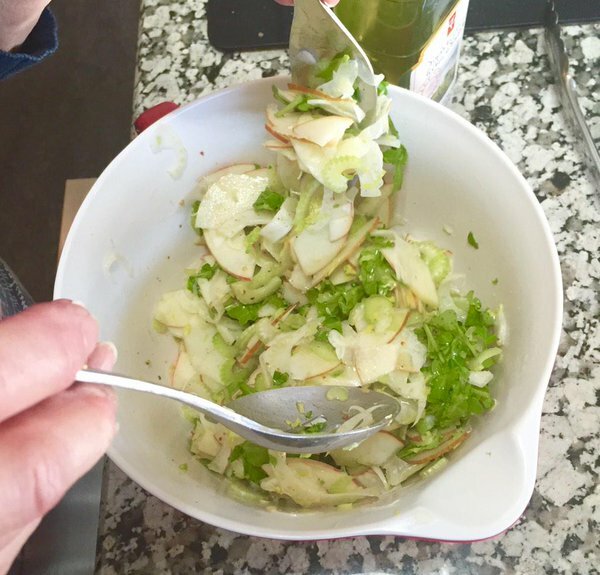 Slice apple, pear, fennel and celery and place in a large bowl. Sprinkle with lemon juice and toss. Put first 5 ingredients in a bowl or jar with a lid and whisk or shake well. Add oil slowly. Taste and adjust seasoning to your own preferences. In bowl of food processor combine flour, oats, baking powder, sugar and salt. Whir to reduce oats. In a separate bowl combine buttermilk, maple syrup eggs and vanilla. Beat to combine. Add to dry mixture and process just until a ball begins to form. Sometimes it is necessary to add a bit more buttermilk. Turn out on floured board and knead just a few times. Pat into ¾ inch thickness. Cut with small round cutter or cut into squares or triangles. Bake on parchment lined cookie sheet for 20 – 25 minutes or until lightly browned. Remove from oven. Allow scones to cool for 5 minutes and drizzle with glaze mixture. In a heavy saucepan, reduce the maple syrup to about ½ of its’ original volume. Place butter and cooled maple syrup in a bowl and whip until well-combined. Make a roll with parchment or plastic wrap. Twist the ends and store in fridge or freezer. HINT: You can reduce a larger amount of maple syrup and keep it on hand for lots of uses. HINT#2: If you add some grainy mustard, you can use it in many savoury applications. salt / herbs and/or spices i.e. cumin, coriander, cinnamon, thyme, rosemary, but NOT all of them! 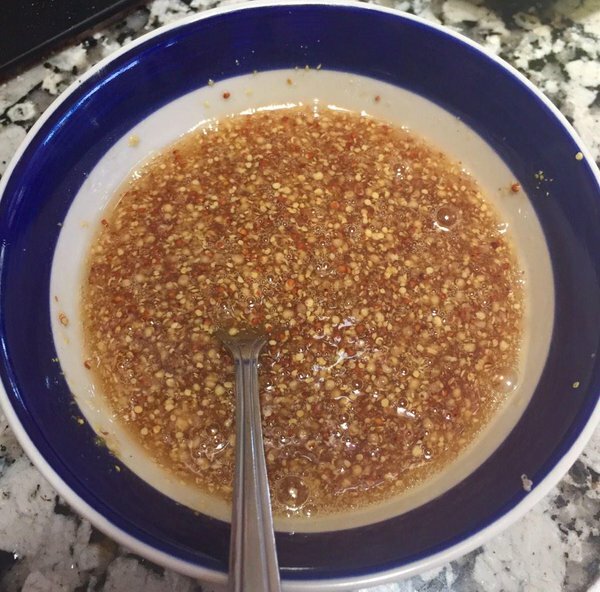 In a heavy bottomed non-reactive saucepan, gently boil syrup to reduce to about ½.
Stir in nuts and whatever spices and/or herbs you prefer. Line a baking sheet with parchment paper and brush with a little butter or oil. 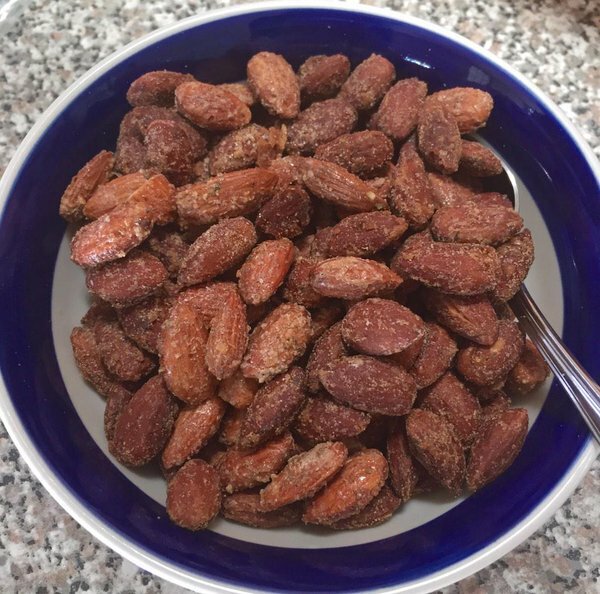 Spread nuts on baking sheet and bake in a 300 degree oven for about 45 minutes or until coating on the nuts is crispy and nuts are browned. Remove from oven and sprinkle with kosher salt. Allow to cool. Pour the maple syrup into the pan and allow it to reduce to about half. Roll the tenderloin around in the glaze to coat it well. Place in 375 degree oven for about 20 minutes. While pork is cooking, cut the apple into quarters and then cut each quarter in half. Slice thinly into little triangles. The cooking time will depend on the thickness of the pork. Remove from oven and place on a clean plate to rest for at least 10 minutes. Cover lightly with foil. Place frying pan over medium heat. Add 1 tbsp. butter and the shallots. Cook for a minute or two and add the apples. Sprinkle with salt and pepper and stir until the apples are tender/crisp. Add the apple cider vinegar, taste and adjust the seasoning. Slice the tenderloin and serve with pan sauce. Boil water in a kettle and set aside. Set out 1 large round casserole dish or 6 to 8 individual ramekins, depending on size. Pour maple syrup into a heavy bottomed pan, and bring maple syrup to a boil over medium heat. Watching it carefully, allow it to reduce to about 1/3 of the original volume. The syrup should form threads when dropped from a spoon. If using butter, stir it in quickly. If caramel doesn’t harden completely after cooling, place the container(s) in the freezer to harden. Break eggs and yolks into large bowl and whisk vigorously with vanilla. If using maple syrup, add the maple syrup and make sure it is incorporated. Heat milk and cream in a saucepan, but do NOT boil. Place custards into a pan at least as deep as the containers and large enough to fit all of them. Place the pan on a shelf in the middle of the oven and pour in enough of the hot water to come halfway up the sides of the custard containers. Close the oven door and cook for ½ hour. Check the doneness of the custard by checking to see if it still ‘jiggles’. Remove from the oven and allow to sit in the water bath for about ½ hour. When ready to serve, run a sharp knife around the edges of the container and place plate over the top. Quickly invert the plate and the custard should drop on to the plate with caramel sauce on the top.